OUR PASTOR Rev. Richard Marion Guest hales from the Southside of Chicago. Father was educated at Saint Bede the Venerable Grade School and Bogan Public High School before pursuing a double degree in Biology and Theology from Loyola University of Chicago. After college, Father earned a master’s degree in Old Testament studies from Vanderbilt University in Nashville, Tennessee. After working as a case manager with the elderly population on Chicago’s Westside for a few years, Father finally responded to the Lord’s invitation to serve Him as a priest. He’d felt called to the priesthood since childhood – but always let something get in the way of his response. He moved out to Northern Virginia and entered Mount Saint Mary’s Seminary in Emmitsburg, Maryland, where he earned the degree of Master’s of Divinity. Father was ordained to the priesthood by Bishop John R. Keating on May 21, 1994, at the Cathedral of Saint Thomas More in Arlington. Before ordination to the priesthood, he had served as a transitional deacon at Saint Lawrence the Martyr Parish in Franconia. Upon ordination, Father was assigned as parochial vicar to Saint William of York Parish in Stafford, from 1994 through 1998. His second assignment was as parochial vicar of Saint Catherine of Siena in Great Falls, from 1998 until 2002. In 2002, Bishop Loverde appointed Father Guest parochial administrator of Saint Theresa Church and tasked him with building the parish church. 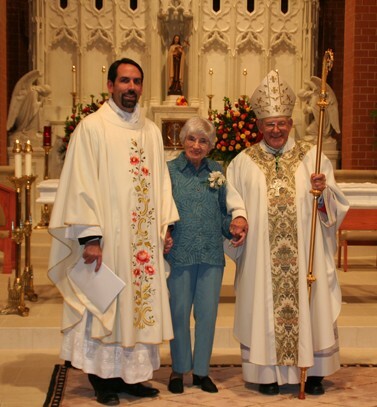 Father was installed as pastor of Saint Theresa in the summer of 2004. While at Saint Theresa, Father has “enjoyed” the work of overseeing the construction of the parish church, additional parking, and a multipurpose addition to the parish school building. Father is excited to announce the completion of the perpetual adoration chapel to Saint Theresa. In his spare time, Father enjoys travel; his favorite vacation destination is checking in with the “boss” in Rome. While he remains loyal to the White Sox – and whoever plays the Cubs, he has acquired a “local allegiance” to the Washington Nationals. Father feels privileged to have had the blessing of serving as the “chief shepherd” of Saint Theresa Parish for the past fifteen years and hopes to have the opportunity to do so for many more years, God – and bishop – willing. He feels truly blessed to have had the opportunity to share in the lives of the parishioners and is most grateful for their support. Fr. Jordan Willard grew up in Hillsboro, Virginia as the third in a family of twelve brothers and sisters, attending the parish of St. Francis de Sales in Purcellville. He attended High School at an Opus Dei institute, The Heights School, in Potomac, Maryland, and graduated in the spring of 2009. Thereafter, he entered military school at Virginia Polytechnic Institute and State University to study chemical engineering while in the NROTC program for the U.S. Marines. Then, having felt God’s call, he transferred from Virginia Tech into seminary for the Diocese of Arlington in the fall of 2010. Fr. Willard was sent to the Pontifical College Josephinum, where he completed his undergraduate studies, obtaining a B.A. in Philosophy in the spring of 2013. He continued theology studies at the Josephinum, and was ordained by Archbishop William E. Lori of Baltimore to the Diaconate, June 4th, 2016. For his diaconate year, Fr. Willard worked at St. Charles Borromeo Parish. The following year, he completed studies at the PCJ seminary wit a M.Div. in a class of 19 other seminarians. On June 10th, 2017, Fr. Willard was ordained to the priesthood by Bishop Michael Burbidge of Arlington, and thereafter was assigned to St. Theresa Parish. Father Barnes was born in Denver, Colorado in 1985. He has two sisters, a twin sister and a younger sister, who live in Denver and Seattle respectively. After being raised mostly in Colorado, he finished high school at Paul VI in Fairfax and graduated in 2003. He then graduated from the University of Virginia in 2007 after studying history and economics. While at college, Father Barnes discerned a vocation to the priesthood and entered the seminary for the Diocese of Arlington. He spent his first two years in the seminary at St. Charles Borromeo in Philadelphia and his final four years in the seminary at the Pontifical North American College in Rome, Italy. He earned a Bachelor of Sacred Theology (STB) from the Gregorian University in 2012 and a Licentiate of Sacred Theology (STL) in 2014 from the Angelicum. He was ordained a deacon at St. Peter’s Basilica in Rome, Italy on October 4, 2012 and a priest on June 8, 2013 at the Cathedral of St. Thomas More in Arlington. He was assigned to St. Mary’s in Alexandria from 2014-18 and has been at St. Theresa’s since June 2018. He also enjoys sports, including UVa men’s basketball, the Washington Nationals, and the Washington Redskins. Deacon Paul Konold was born and raised in Evanston, Illinois, and attended Catholic schools grades K through 12. Upon graduation, he enlisted in the Navy and became a sonar technician. What started out as a 3-year enlistment ended up as a 20-year career, and he retired as a senior chief petty officer. While in the Navy, he earned a bachelor’s degree in business administration from the University of San Diego. In 1972, Paul married Stephanie Fiore, a newly graduated schoolteacher from Boston, and during the 70’s, God blessed them with a son and two daughters. They raised their children in southeastern Connecticut and were active in parish life. Stephanie taught at St. Joseph elementary school in New London and all three children attended Catholic schools grades K through 12. In 1990, Paul felt called to the diaconate, and that started a formation journey that would span two dioceses and take 12 years to complete. He earned a master’s degree in pastoral ministry from Providence College, and on October 19, 2002, Bishop Robert J. McManus ordained him to the diaconate at the Cathedral of Sts. Peter and Paul in Providence, Rhode Island. Upon ordination, Deacon Paul was assigned to St. Kevin Church in Warwick, RI and to the Ministry for the Deaf in the diocese. He remained in those ministries until 2007 when his employer, Amgen, transferred him from its facility in RI to its facility in Seattle, Washington. Archbishop Alexander J. Brunett granted him faculties to minister in the Archdiocese of Seattle and assigned him to St. Michael Church in Snohomish, WA. In 2014, Stephanie retired after 30 years of teaching in Catholic elementary schools and Deacon Paul retired shortly after that. They moved to Loudoun County to be close to their three grandchildren, and in June 2015, Bishop Paul S. Loverde granted Deacon Paul faculties to minister in the Diocese of Arlington and assigned him to St. Theresa’s. Deacon Paul and Stephanie are very pleased to make St. Theresa’s and their grandchildren the focus of their retirement.